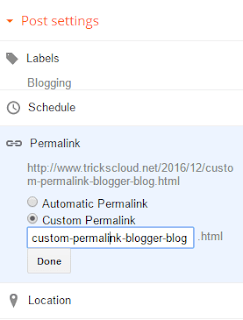 What Is Custom Permalink in BlogSpot? In the second example, the custom permalink is contained only essential keywords.Which play a major role in On-Page SEO of your blog. When you writing a new post you will get Post Settings at the right side of Post Editor.In that there is an option Permalink, this option allows us to remove the unwanted keywords from permalink. First Start writing a new post then click on Permalink on the right side of the post editor. 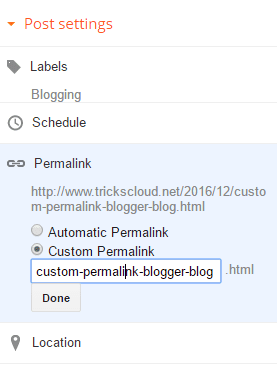 Now click on Custom Permalink in order to remove unwanted keywords. Then click on Done.Your permalink structure will be changed.Then you publish your post I am sure you will get a better result than earlier. 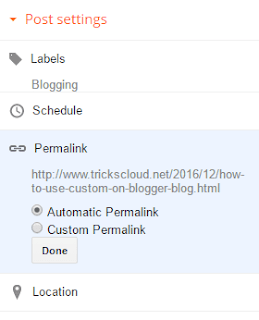 I hope you like this post How To Use Custom Permalink On Blogger Blog.So please share this post Using share buttons below to support us and to get another new post like this.